The cell culture techniques are in the base of any biology-based science. The standard techniques are commonly static platforms as Petri dishes, tissue culture well plates, T-flasks, or well plates designed for spheroids formation. These systems faced a paradigm change from 2D to 3D over the current decade driven by the tissue engineering (TE) field. However, 3D static culture approaches usually suffer from several issues as poor homogenization of the formed tissues and development of a necrotic center which limits the size of in vitro tissues to hundreds of micrometers. 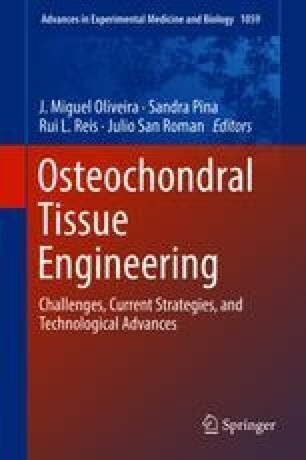 Furthermore, for complex tissues as osteochondral (OC), more than recovering a 3D environment, an interface needs to be replicated. Although 3D cell culture is already the reality adopted by a newborn market, a technological revolution on cell culture devices needs a further step from static to dynamic already considering 3D interfaces with dramatic importance for broad fields such as biomedical, TE, and drug development. In this book chapter, we revised the existing approaches for dynamic 3D cell culture, focusing on bioreactors and microfluidic systems, and the future directions and challenges to be faced were discussed. Basic principles, advantages, and challenges of each technology were described. The reported systems for OC 3D TE were focused herein. This work is a result of the project FROnTHERA (NORTE-01-0145- FEDER-000023), supported by Norte Portugal Regional Operational Programme (NORTE 2020), under the Portugal 2020 Partnership Agreement, through the European Regional Development Fund (ERDF). Thanks are also due to the Portuguese Foundation for Science and Technology (FCT) for the project PEst-C/SAU/LA0026/201 and for the distinction attributed to J.M. Oliveira under the Investigator FCT program (IF/00423/2012 and IF/01285/2015). The authors also thank FCT for the Ph.D. scholarship provided to R. F. Canadas (SFRH/BD/92565/2013).